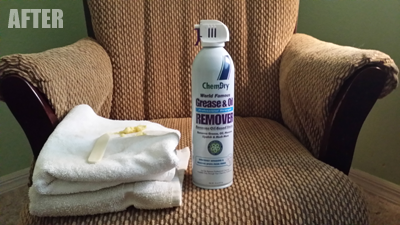 Here is one of the best ways to get grease stains out of upholstery, Chem-Dry’s Grease and Oil Remover. It’s a professional strength solvent designed to do exactly what the name says, remove oil and grease from carpet and upholstery. 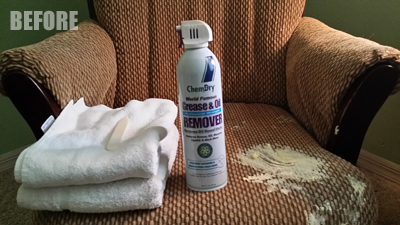 You can use it to remove cooking oils, body oils, and other oil based stains from carpet and upholstery. Watch this how to video to see it in action. Although it is a professional strength cleaning solvent Chem-Dry of Tampa sell’s it to consumers in the Tampa FL area. Just call (813) 402-8403 and we will deliver it to home for no extra cost.